Most high-speed photography is done in the dark with a slow shutter speed and the motion being captured by a flash on low power , usually resulting in a captured speed of around 1/10000th of a second . 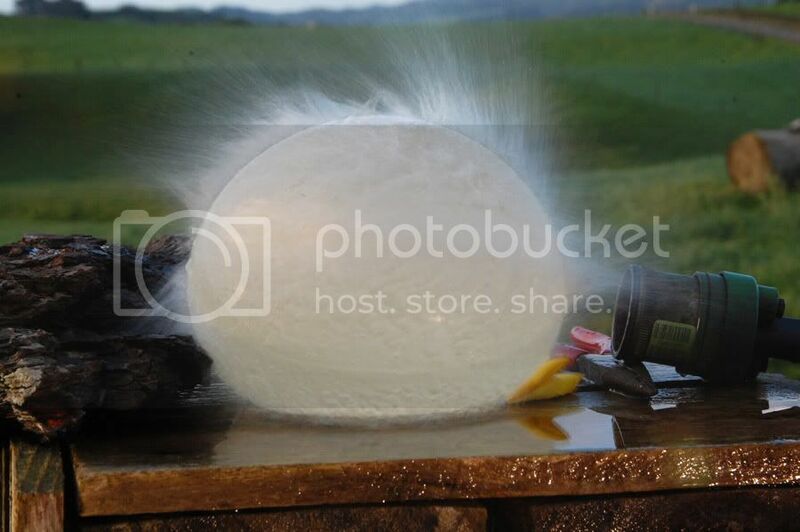 See my post on high speed photography . Tonight I managed to wire up my camera to trigger an event when the shutter opens and at very high speed . I see many possibilities for this especially since I will no longer need to wait for darkness to do high speed photography . I call this "superspeed" photography and am not sure if it has ever been done before . Doesn't look like much does it ? But that spark was triggered by the shutter of my camera opening at 1/200th second . I did a few more tests and managed to take it all the way to 1/4000th sec and still capture the spark - triggered by my camera's shutter opening . Then I went indoors to try and find something that would react nicely to a 20000 volt spark . A water drop didn't do much . Some brown sugar looked slightly better . I will try to find something that reacts nicely to a spark going through it , or perhaps use my 'monster flash' modification with its giant capacitor attached to generate some 'real' energy . Today I added a high performance coil to my hammerhead flash and am getting about 50 000 volts out of it .